When you’re missing teeth, having them replaced is just one part of the recovery process. You’ll need to know how to eat with your prosthetics to prevent any unnecessary pain and allow your gums to continue healing. Also, certain foods will be better to consume than others. 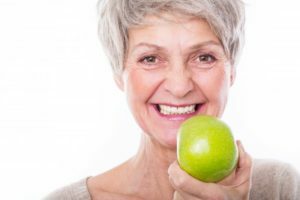 As you read on, your dentist weighs in to discuss all of these things and will provide some tips you should be mindful of when consuming foods with your dentures in Waco? Your local dentist weighs with the answers you need. Why Do My Eating Habits Matter? Before we delve into some tips for how to eat with your dentures, let’s first take a look at why the types of foods you eat, your chewing motion and other factors matter after you’re fitted with your new prosthetics. In many cases, patients will have already undergone another restorative procedure prior to receiving dentures. Thus, their gums may still be sensitive and attempting to heal. It becomes more important, then, for dentures to be used in the proper manner. To help overcome the initial soreness of maybe recently having your teeth pulled, it’s best to start with a liquid diet that includes purees and other soft foods like applesauce, puddings, cooked cereals, chopped eggs and soup broth. Be mindful of the potential danger of hot liquids, though. When wearing dentures, it may be harder at times to judge the temperature of certain items, which can lead to a burned or irritated mouth. Move the foods from side to side when chewing. Chew slowly and thoroughly before swallowing. Take small bites to protect against choking. Fruits and Vegetables – Slice them into very thin pieces. Whole Grain Bread – When eating breads or cereals be sure to do so with some form of liquid. Otherwise, they may stick to your teeth, making it harder to chew and swallow. Tough Meats – It’s best to avoid tough meats like certain cuts of beef, buffalo and others. Instead, you can eat more poultry, fish, eggs or legumes. If you decide to eat meat on occasion, you can stew it for more tenderness. Getting your new dentures is a fortunate occasion because it means that you have a new lease on life. You’ll once again be able to smile with confidence and enjoy a normal existence. To schedule a consultation with your dentist in Waco, reach out today. Dr. Rick Cofer earned his Doctor of Dental Surgery degree from Baylor School of Dentistry and then went on to open his first dental practice. Since then, he’s remained steadfast about staying abreast of the latest changes in the world of dentistry by maintaining affiliation with organizations like the Seattle Study Club and others. Dr. Cofer helps patients regain the lives they once had with dentures at Premier Family Dental and can be reached for more information through his website. by: Dr. Rick Cofer at July 16, 2018 .